SD-WAN has emerged over the previous 5 years to a point where its importance can’t be ignored. This infrastructure change is what will be providing the foundation and infrastructure of future digital transformation. It developed out of a previous technology, SDN, which had failed to find its niche or killer app. SD-WAN makes a compelling story for anyone want to simplify network deployment and management overheads. SD-WAN vendors often promise zero-touch deployments. This means that the Customer Premise Equipment (CPE) is just plugged into the network and switched on. No other configuration needs done at the branch. All of the branches networking can be managed centrally. This is usually done from a corresponding box located in the cloud or enterprise headquarters. The need for IT teams at each branch with intimate knowledge of the network is completely gone. But how does SD-WAN help the network users, rather than the administrators? SD-WAN applies sophisticated routing logic between endpoints in the network to ensure data flowing between sites is using the best path possible. QOS is applied to ensure important data is delivered effectively. While these infrastructure changes improve the performance of the network generally, remote users and branches with poorer connections are let down. A key selling point is often that the broadband or DIA links are now a viable alternative to costly and relatively low-bandwidth MPLS links. The SD-WAN solution can choose the most efficient route through the network. This is great, but if the network is slow, the most efficient route may still not be good enough for the end user. A complete SD-WAN solution must include a dedicated WAN optimization solution to deliver substantial benefits to users that need them most. Those branches that rely on their broadband links still need WAN op to provide a good user experience. 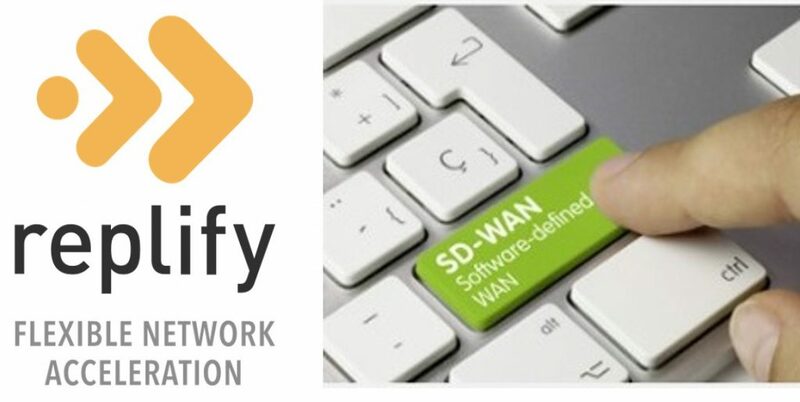 Replify Accelerator can provide this by reducing the amount of data being sent across the WAN links. In some cases we reduce the data on the wire by as much as 98%. These huge gains are only possible when the optimisation logic sits close to the application layer. At this layer WAN Op delivers user experience improvement while complementing the routing optimisation happening at the lower layers thanks to the SD-WAN infrastructure. Replify Accelerator WAN optimization can also provide benefits at the higher level TCP network layer. We adapt the TCP link’s characteristics to suit the given network conditions. Consequently, we can still provide benefits for all TCP traffic, even encrypted data! Commentators, customers and even SD-WAN vendors themselves are highlighting how important and essential WAN Optimisation is to delivering enterprises and end-users the experience they expect when adopting SD-WAN technology. Replify Accelerator’s flexible integration options and deployment model allows you to quickly add this capability to your SD-WAN solution. Why not contact us to see how we can enhance your SD-WAN solution or read our white paper.